CYAN Forums • View topic - Install/Play Uru: CC on Mac 10.8.2? 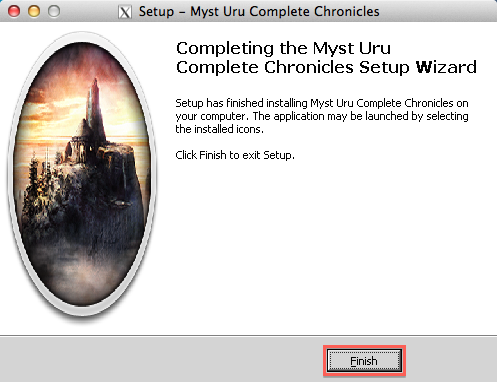 Install/Play Uru: CC on Mac 10.8.2? 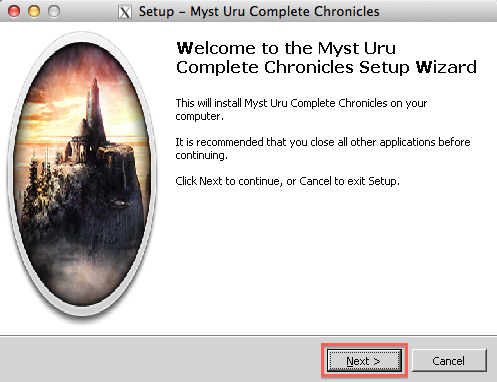 Re: Install/Play Uru: CC on Mac 10.8.2? 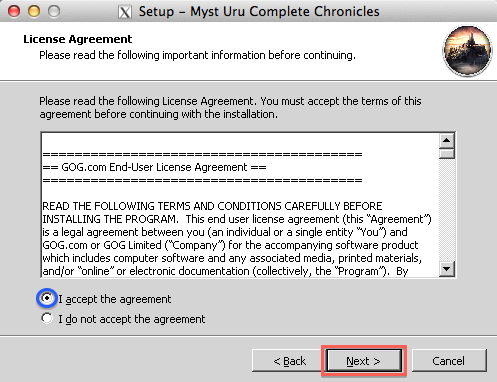 Oh, and I did use the GOG installer... I had to download it 2x, as it stalled out the 1st time, but the 2nd time it said 100%. Was I right to move the GOG download to 'MacintoshHD'? Am I supposed to move the Wineskin(s) somewhere in particular? Also, even though I R-clicked> Save Link As~ I just noticed there is another error window that disappears really fast saying something about not being able to...(didn't quite catch it)...to .dmg. Soooo, wasn't the point of 'Save Link As' to make it no longer .dmg? Let's check the filesize of your setup_uru_cc_2.0.0.5.exe file. The filesize I see for mine is 1.75GB. If yours is lower than that, I suspect your download didn't complete properly. If that's not the problem then we'll need to go through things step by step. 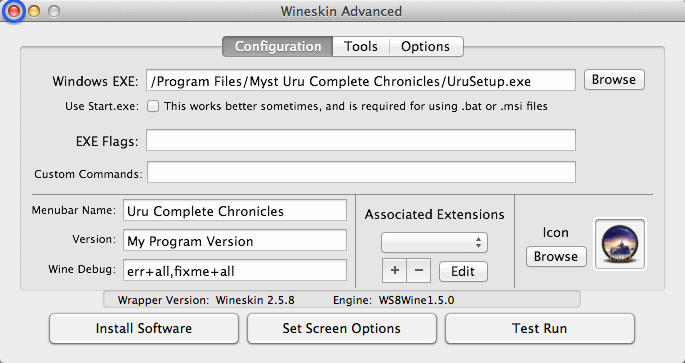 BTW, the Wineskin menu screenshot I used was from the internet and so might have been for a different wrapper version than the one korovev and/or I used. "Install Windows Software" and "Install Software" should be equivalent. The wrapper version isn't terribly important in terms of whether it will work properly; the engine version is critical though. Regarding that error message when you try to download the DMG file, I can only guess that your browser and/or security settings might be interfering with the download (perceive it as a security risk). Without knowing what error message is being thrown, I can't really help you much further with figuring out how to fix whatever is happening. If you can't get this to work and really want to use my DMG, let me know and I'll give you temporary access to my cloud account, where you (hopefully) will be able to download it successfully. If we go that route, it will probably require some further instructions on the steps involved. So these instructions are for using my DMG and wrapper. No guarantees that it will be quite the same if you try this with korovev's instead. [Reveal] Spoiler: Long detailed instructions ahead!! 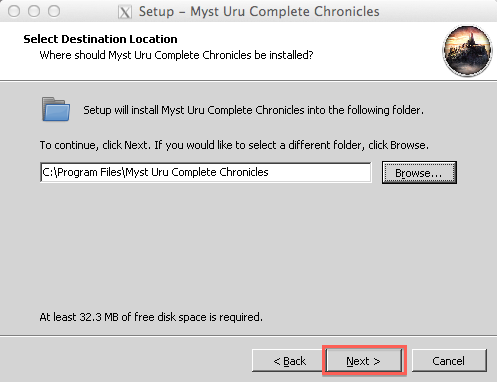 In using my "Uru Complete Chronicles.dmg" file, the total filesize should be 215.2MB once it's downloaded (and yes, it's very big!). 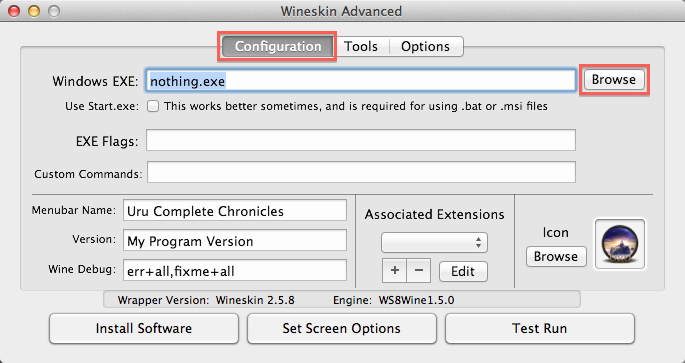 If you double-click the file, it should mount on your hard drive as an extra drive (the same way all DMG files mount, when you are installing new applications) and pop up a small screen showing the Wineskin Application along with a shortcut to your Applications folder. 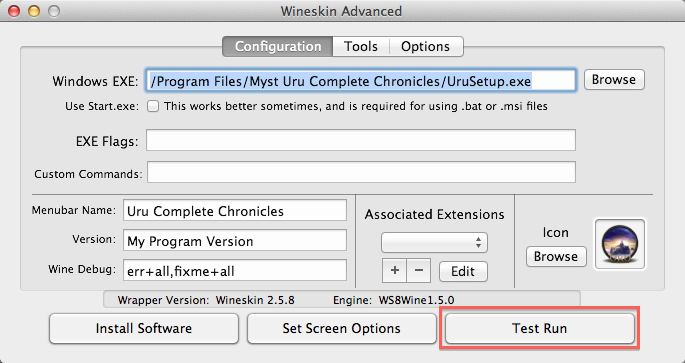 Dragging the Uru Complete Chronicles icon over the Applications icon will initiate the installation of the Wineskin App into your Applications folder. Once that is completed, you can eject the DMG by clicking the up arrow in your Finder sidebar. 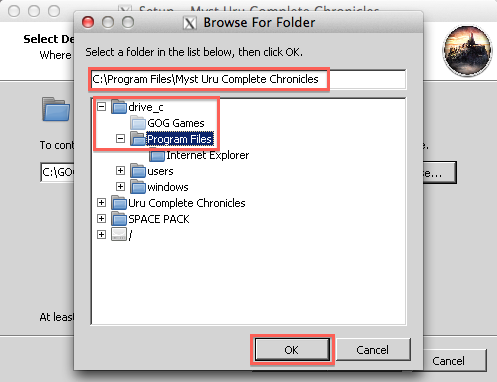 Next, go to your Applications folder, find the Uru Complete Chronicles application and double click it, which will launch Wineskin. Here's where the installation process is different and more complicated. Click the Advanced button and then go to the Tools tab (yes, it doesn't really look like a tab...). Then click the Command Line Shell button. cd An abbreviation for "change directory". The cd is followed by a space and the name of where you want to go. To get started, I typed cd / which means go to the very top-level directory. Once there, I could start to drill down to where I'd stashed my setup_uru_cc_2.0.0.5.exe file. dir An abbreviation for "display the current directory contents". You can use this to view the different folder and filenames for your current location, which is helpful if you aren't sure where you are or what is there. Keep in mind that if there is lots of content, the output will look very busy (this is why it's really handy to have that Finder window nearby). If you need to go back up a level (if you just went to the wrong directory), then typing cd .. will take you back up one level. You'll notice that the command line window shows you your location on the left side of each line; very helpful! Next, things will start to install!! This will close the command line window. Next, go back to the Wineskin window and click the Configuration tab. 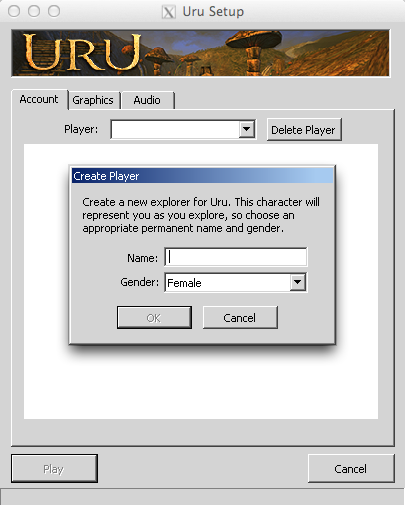 You'll see that the Windows EXE box isn't pointing to the game file, so click the Browse button and then find the UruCC installation inside the Wineskin. 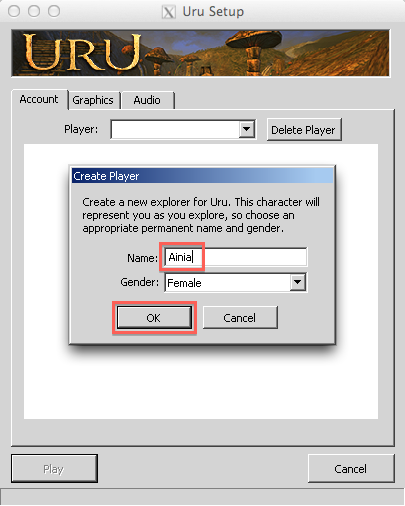 After that, click the Test Run button to ensure UruCC works correctly. Once you've done enough with the game to feel satisfied it's working, you can quit the game in order to finish the test run. 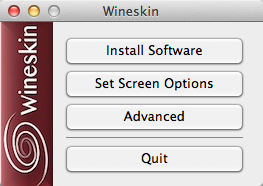 Next, you can quit Wineskin by either clicking the upper left red button or using the Mac Wineskin menu and selecting Quit Wineskin. The second method is more reliable since sometimes part of Wineskin may still be running in the background where you might not notice it. 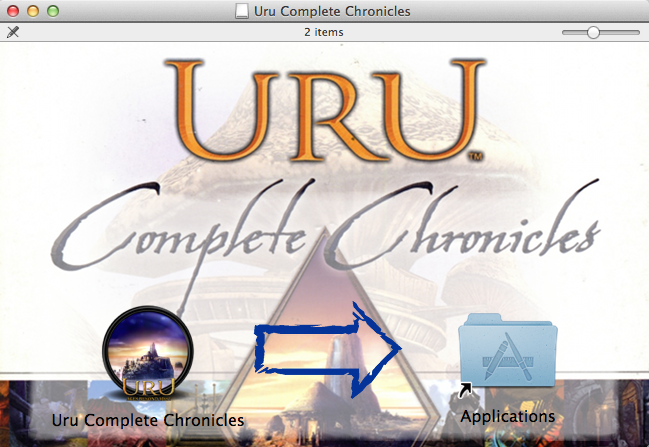 To play the game, go to the Uru Complete Chronicles application in your Applications folder and double-click. Great tutorial, anyway. The procedure is about the same in my case, but I put the installer inside the drive_c folder inside the wrapper, point the wrapper from the Configuration panel, launch it with Test (so I have a clue, if something goes wrong), then once Uru is installed point the wrapper to UruSetup.exe (and remove the installer, of course). I never needed the /nogui option, but I’m using the usual 2.6.0/1.7.18 combination, perhaps something changed in the meantime. I’ll check again the procedure this evening (I’m in Europe ) to see if I’m missing something. I didn't need to use the /nogui option either on my original install but did on my test yesterday (which gets into one of my perpetual gripes about Windows, which is way off topic ). Anyway, this seems to be a common enough problem/error that I found a solution on the GOG forums, tested it and found that it worked. Unfortunately, I have no idea how to embed or automate this into the wrapper itself for posterity, hence the detailed instructions. delia, let us know if this works for you. Yowza, you weren't kidding about 'long detailed instructions'! I'll admit, I'm a lil intimidated , but here goes! In my finder, to get to 'setup_uru_cc_2.0.0.5.exe', I have to start with 'MacintoshHD'. 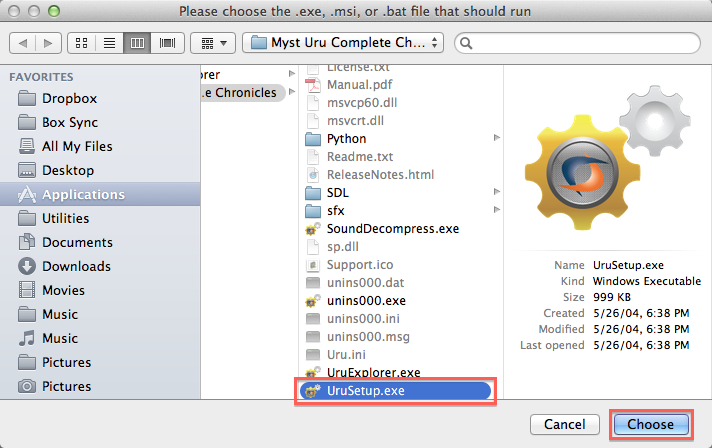 In 'MacintoshHD' is the folder 'uru_complete_chronicles', which has the 'setup...exe' file. you are on a read only volume. too. All software must be installed in C: drive. So, I tried to install the game and for me it worked without tweaks. 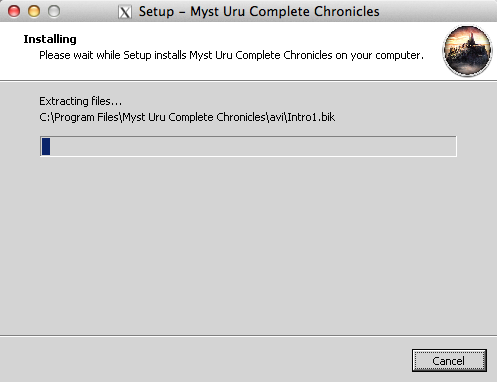 The installer looks a bit different, though (see below). I then tested it once, moved the installer away from the drive_c folder, then closed everything. 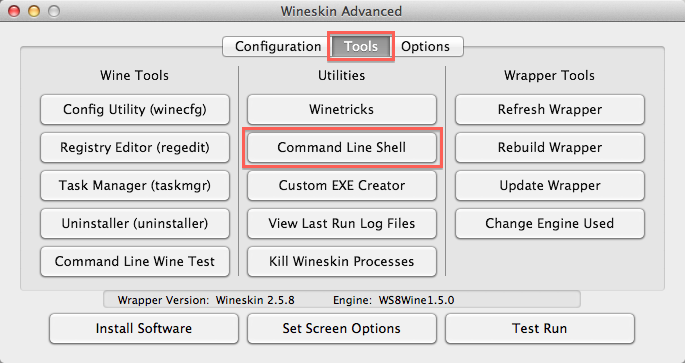 One thing I guess I hadn't noticed (when I clicked 'Advanced') before, is that the Wineskin engine was WS8Wine... (sorry, I can't remember what the #'s were + can't change it back to check...)... so I clicked 'Change Engine Used', where the only option available was WS9Wine1.5.21. So, I changed it, hit install, and it actually installed. The intro played fine, I ended up in the scrub + started walking around. However, as soon as I got near the guy + his trailer REALLY REALLY loud, distorted music started playing. Like loud enough that with the volume at 1, I couldn't keep my headphones on. It also sounded like under the music someone (presumably trailer dude?) was trying to talk to me, but I couldn't make out one word. I know I read somewhere about sound glitches? Is this one? Korovev + Ainia~ thank you for your help and patience! Yep, it’s a well known bug, and there isn’t much to do about it, apparently. For Ainia, using the 1.5.0 engine solved it, but not for me. You’ll probably hear that noise again in Relto. Aha. So, obvious questions I suppose: Is trailer guy trying to tell me anything important? If I just turn the sound off for a bit are there other vital sounds I may miss? Zandi just says that Yeesha has left a message in the Cleft and can give a few hints. Here you can find a transcript. 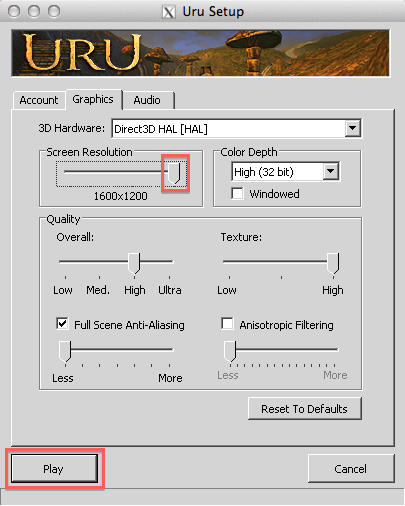 As for the shortcut, you should click Browse from the Advanced pane again, and select UruSetup.exe (by default in the GOG Games folder, see above). Then you should be able to launch it simply by double clicking the wrapper. I still can't get it to open simply, but hey, at least I can play!